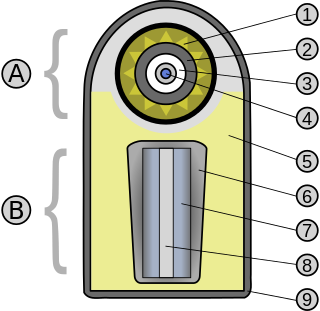 Ivy Mike was the codename given to the first test of a full-scale thermonuclear device, in which part of the explosive yield comes from nuclear fusion. It was detonated on November 1, 1952 by the United States on the island of Elugelab in Enewetak Atoll, in the Pacific Ocean, as part of Operation Ivy. It was the first full test of the Teller–Ulam design, a staged fusion device. Outer space, or just space, is the expanse that exists beyond the Earth and between celestial bodies. Outer space is not completely empty—it is a hard vacuum containing a low density of particles, predominantly a plasma of hydrogen and helium, as well as electromagnetic radiation, magnetic fields, neutrinos, dust, and cosmic rays. The baseline temperature, as set by the background radiation from the Big Bang, is 2.7 kelvins. The plasma between galaxies accounts for about half of the baryonic (ordinary) matter in the universe; it has a number density of less than one hydrogen atom per cubic metre and a temperature of millions of kelvins; local concentrations of this plasma have condensed into stars and galaxies. Studies indicate that 90% of the mass in most galaxies is in an unknown form, called dark matter, which interacts with other matter through gravitational but not electromagnetic forces. Observations suggest that the majority of the mass-energy in the observable universe is a poorly understood vacuum energy of space, which astronomers label dark energy. Intergalactic space takes up most of the volume of the universe, but even galaxies and star systems consist almost entirely of empty space. Underground tests in the United States continued until 1992 (its last nuclear test), the Soviet Union until 1990, the United Kingdom until 1991, and both China and France until 1996. In signing the Comprehensive Nuclear-Test-Ban Treaty in 1996, these states have pledged to discontinue all nuclear testing; the treaty has not yet entered into force because of failure to be ratified by eight countries. Non-signatories India and Pakistan last tested nuclear weapons in 1998. North Korea conducted nuclear tests in 2006, 2009, 2013, 2016, and 2017. The most recent confirmed nuclear test occurred [update] in September 2017 in North Korea. The Republic of India has developed and possesses weapons of mass destruction in the form of nuclear weapons. Though India has not made any official statements about the size of its nuclear arsenal, recent estimates suggest that India has 110 nuclear weapons — consistent with earlier estimates that it had produced enough weapons-grade plutonium for up to 75–110 nuclear weapons. In 1999, India was estimated to have 800 kg of separated reactor-grade plutonium, with a total amount of 8,300 kg of civilian plutonium, enough for approximately 1,000 nuclear weapons. Pakistan is one of nine states to possess nuclear weapons. Pakistan began development of nuclear weapons in January 1972 under Prime Minister Zulfikar Ali Bhutto, who delegated the program to the Chairman of the Pakistan Atomic Energy Commission (PAEC) Munir Ahmad Khan with a commitment to having the bomb ready by the end of 1976. Since PAEC, consisting of over twenty laboratories and projects under nuclear engineer Munir Ahmad Khan, was falling behind schedule and having considerable difficulty producing fissile material, Abdul Qadeer Khan was brought from Europe by Bhutto at the end of 1974. As pointed out by Houston Wood, Professor of Mechanical & Aerospace Engineering, University of Virginia, Charlottesville, in his article on gas centrifuges, "The most difficult step in building a nuclear weapon is the production of fissile material"; as such, this work in producing fissile material as head of the Kahuta Project was pivotal to Pakistan developing the capability to detonate a nuclear bomb by the end of 1984. Underground testing refers to nuclear tests conducted under the surface of the earth, at varying depths. Underground nuclear testing made up the majority of nuclear tests by the United States and the Soviet Union during the Cold War; other forms of nuclear testing were banned by the Limited Test Ban Treaty in 1963. True underground tests are intended to be fully contained and emit a negligible amount of fallout. Unfortunately these nuclear tests do occasionally "vent" to the surface, producing from nearly none to considerable amounts of radioactive debris as a consequence. Underground testing, almost by definition, causes seismic activity of a magnitude that depends on the yield of the nuclear device and the composition of the medium in which it is detonated, and generally creates a subsidence crater. In 1976, the United States and the USSR agreed to limit the maximum yield of underground tests to 150 kt with the Threshold Test Ban Treaty. 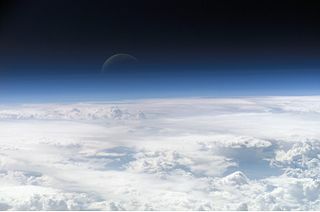 The atmosphere of Earth is the layer of gases, commonly known as air, that surrounds the planet Earth and is retained by Earth's gravity. The atmosphere of Earth protects life on Earth by creating pressure allowing for liquid water to exist on the Earth's surface, absorbing ultraviolet solar radiation, warming the surface through heat retention, and reducing temperature extremes between day and night. A mushroom cloud is a distinctive pyrocumulus mushroom-shaped cloud of debris/smoke and usually condensed water vapor resulting from a large explosion. The effect is most commonly associated with a nuclear explosion, but any sufficiently energetic detonation or deflagration will produce the same effect. They can be caused by powerful conventional weapons, like thermobaric weapons, including the ATBIP and GBU-43/B Massive Ordnance Air Blast. 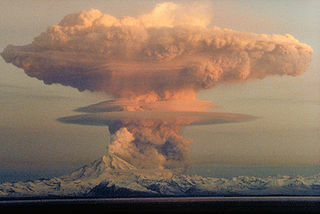 Some volcanic eruptions and impact events can produce natural mushroom clouds. Nuclear fallout, or fallout, is the residual radioactive material propelled into the upper atmosphere following a nuclear blast, so called because it "falls out" of the sky after the explosion and the shock wave have passed. It commonly refers to the radioactive dust and ash created when a nuclear weapon explodes. The amount and spread of fallout is a product of the size of the weapon and the altitude at which it is detonated. Fallout may get entrained with the products of a pyrocumulus cloud and fall as black rain. March 1, 1995 NTS Area U1a 37°00′41″N116°03′35″W﻿ / ﻿37.01139°N 116.05983°W﻿ / 37.01139; -116.05983 1,222 metres (4,009 ft) - 293 metres (961 ft) Kismet was a proof of concept for modern hydronuclear tests; it did not contain any SNM (Special Nuclear Material - Plutonium or Uranium). July 2, 1997 10:--:-- NTS Area U1a 37°00′41″N116°03′35″W﻿ / ﻿37.01139°N 116.05983°W﻿ / 37.01139; -116.05983 1,222 metres (4,009 ft) - 293 metres (961 ft) Provided information on the behavior of new plutonium alloys compressed by high pressure shock waves; same as Stagecoach but for the age of the alloys. September 18, 1997 NTS Area U1a.101A 37°00′37″N116°03′32″W﻿ / ﻿37.01036°N 116.05888°W﻿ / 37.01036; -116.05888 1,222 metres (4,009 ft) - 290 metres (950 ft) Holog and Clarinet may have switched locations. March 25, 1998 NTS Area U1a 37°00′41″N116°03′35″W﻿ / ﻿37.01139°N 116.05983°W﻿ / 37.01139; -116.05983 1,222 metres (4,009 ft) - 290 metres (950 ft) Provided information on the behavior of aged (up to 40 years) plutonium alloys compressed by high pressure shock waves. December 11, 1998 NTS Area U1a 37°00′41″N116°03′35″W﻿ / ﻿37.01139°N 116.05983°W﻿ / 37.01139; -116.05983 1,222 metres (4,009 ft) - 290 metres (950 ft) Plutonium surface ejecta studies. February 9, 1999 NTS Area U1a.101C 37°00′36″N116°03′32″W﻿ / ﻿37.01003°N 116.05898°W﻿ / 37.01003; -116.05898 1,222 metres (4,009 ft) - 290 metres (950 ft) Holog and Clarinet may have switched places on the map. March 22, 2000 NTS Area U1a 37°00′41″N116°03′35″W﻿ / ﻿37.01139°N 116.05983°W﻿ / 37.01139; -116.05983 1,222 metres (4,009 ft) - 290 metres (950 ft) Plutonium surface ejecta studies, followup to Cimarron. August 29, 2002 19:00:-- NTS Area U1a 37°00′41″N116°03′35″W﻿ / ﻿37.01139°N 116.05983°W﻿ / 37.01139; -116.05983 1,222 metres (4,009 ft) - 290 metres (950 ft) Plutonium surface studies (optical analysis of spall). Used wrought plutonium from Rocky Flats. September 26, 2002 19:00:-- NTS Area U1a 37°00′41″N116°03′35″W﻿ / ﻿37.01139°N 116.05983°W﻿ / 37.01139; -116.05983 1,222 metres (4,009 ft) - 290 metres (950 ft) Plutonium surface studies (optical analysis of spall), followup to Mario. Used cast plutonium from Los Alamos. April 1, 2005 NTS Area U1a 37°00′41″N116°03′35″W﻿ / ﻿37.01139°N 116.05983°W﻿ / 37.01139; -116.05983 1,222 metres (4,009 ft) - 190 metres (620 ft) April–May 2005, a series of mini-hydronuclear experiments interpreting Armando results. August 31, 2006 01:00:-- NTS Area U6c 36°59′12″N116°02′38″W﻿ / ﻿36.98663°N 116.0439°W﻿ / 36.98663; -116.0439 1,222 metres (4,009 ft) - 190 metres (620 ft) "…confirm nuclear performance of the W88 warhead with a newly-manufactured pit." Early pit studies. January 1, 2007 NTS Area U1a 37°00′41″N116°03′35″W﻿ / ﻿37.01139°N 116.05983°W﻿ / 37.01139; -116.05983 1,222 metres (4,009 ft) - 190 metres (620 ft) Feb-6 thru May 3, 2007, 12 mini-hydronuclear experiments in thermos-sized flasks. September 1, 2012 NTS Area U1a 37°00′41″N116°03′35″W﻿ / ﻿37.01139°N 116.05983°W﻿ / 37.01139; -116.05983 1,222 metres (4,009 ft) - 190 metres (620 ft) Not even a subcrit, contained no plutonium; a dress rehearsal for Pollux. 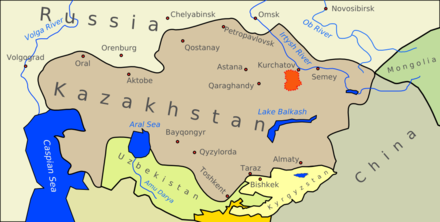 The 6,900-square-mile (18,000 km) expanse of the Semipalatinsk Test Site (indicated in red), attached to Kurchatov (along the Irtysh river). The site comprised an area the size of Wales. Atomic and nuclear tests can involve many hazards. Some of these were illustrated in the U.S. Castle Bravo test in 1954. The weapon design tested was a new form of hydrogen bomb, and the scientists underestimated how vigorously some of the weapon materials would react. As a result, the explosion—with a yield of 15 Mt—was over twice what was predicted. Aside from this problem, the weapon also generated a large amount of radioactive nuclear fallout, more than had been anticipated, and a change in the weather pattern caused the fallout to spread in a direction not cleared in advance. The fallout plume spread high levels of radiation for over 100 miles (160 km), contaminating a number of populated islands in nearby atoll formations. Though they were soon evacuated, many of the islands' inhabitants suffered from radiation burns and later from other effects such as increased cancer rate and birth defects, as did the crew of the Japanese fishing boat Daigo Fukuryū Maru . One crewman died from radiation sickness after returning to port, and it was feared that the radioactive fish they had been carrying had made it into the Japanese food supply. There have been many attempts to limit the number and size of nuclear tests; the most far-reaching is the Comprehensive Test Ban Treaty of 1996, which has not, as of 2013 [update] , been ratified by eight of the "Annex 2 countries" required for it to take effect, including the United States. 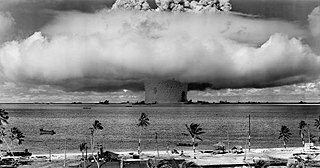 Nuclear testing has since become a controversial issue in the United States, with a number of politicians saying that future testing might be necessary to maintain the aging warheads from the Cold War. 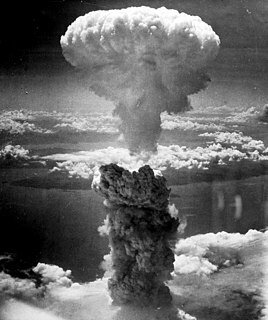 Because nuclear testing is seen as furthering nuclear arms development, many are opposed to future testing as an acceleration of the arms race. October 2, 1992 October 2, 1992 no George. H. W. Bush declares unilateral ban on nuclear testing. Extended several times, not yet abrogated. ↑ Universal Time at the Nevada National Security Site is 8 hours after local time; UT dates are one day after local date for UT times after 16:00. ↑ "The Treaty has not been signed by France or by the People's Republic of China." U.S. Department of State, Limited Test Ban Treaty. ↑ For an overview of the preparations and considerations used in underground nuclear testing, see ""Underground Nuclear Weapons Testing" (Globalsecurity.org)" . Retrieved 2006-10-19. For a longer and more technical discussion, see U.S. Congress, Office of Technology Assessment (October 1989). The Containment of Underground Nuclear Explosions (PDF). Washington, D.C.: U.S. Government Printing Office. Archived from the original (PDF) on 2013-02-27. Retrieved 2018-12-24. ↑ Yang, Xiaoping; North, Robert; Romney, Carl; Richards, Paul R. "Worldwide Nuclear Explosions" (PDF). ↑ Medalia, Jonathan (2005-03-11). "Nuclear Weapons: Comprehensive Test Ban Treaty" (PDF) (IB92099). Congressional Record Service. Retrieved 2013-12-09. 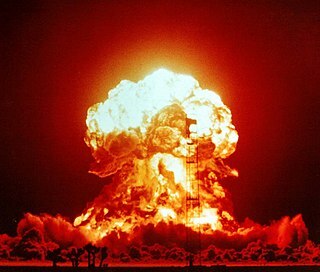 ↑ "US conducts 'subcritical' nuclear test". zeenews.india.com. 2012-12-07. Retrieved 2013-05-28. ↑ Thomas Nilsen (2 October 2012). "Subcritical nuke tests may be resumed at Novaya Zemlya". barentsobserver.com. Retrieved 2017-07-13. ↑ Papazian, Ghazar R.; Reinovsky, Robert E.; Beatty, Jerry N. (2003). "The New World of the Nevada Test Site" (PDF). Los Alamos Science (28). Retrieved 2013-12-12. ↑ Thorn, Robert N.; Westervelt, Donald R. (February 1, 1987). "Hydronuclear Experiments" (PDF). LANL Report LA-10902-MS. Retrieved December 9, 2013. ↑ Conrad, David C. (July 1, 2000). "Underground explosions are music to their ears". Science and Technology Review. Retrieved 9 December 2013. ↑ "Nevada Test Site: U1a Complex subcritical experiments". DOE Nevada. Department of Energy. 2003-02-01. 1 2 Pavlovski, O. A. (1 January 1998). "Radiological Consequences of Nuclear Testing for the Population of the Former USSR (Input Information, Models, Dose, and Risk Estimates)". Atmospheric Nuclear Tests. Springer, Berlin, Heidelberg. pp. 219–260. doi:10.1007/978-3-662-03610-5_17. ISBN 978-3-642-08359-4. ↑ "Radioactive Fallout - Worldwide Effects of Nuclear War - Historical Documents". Atomciarchive.com. ↑ "United States Nuclear Tests: July 1945 through September 1992" (PDF). Las Vegas, NV: Department of Energy, Nevada Operations Office. 2000-12-01. Archived from the original (PDF) on 2006-10-12. Retrieved 2013-12-18. This is usually cited as the "official" US list. ↑ Long, Kat. "Blasts from the Past: Old Nuke Test Films Offer New Insights [Video]". Scientific American. Retrieved 2017-04-24. ↑ "USSR Nuclear Weapons Tests and Peaceful Nuclear Explosions 1949 through 1990". Sarov, Russia: RFNC-VNIIEF. 1996. The official Russian list of Soviet tests. ↑ Mikhailov, Editor in Chief, V.N. ; Andryushin, L.A.; Voloshin, N.P. ; Ilkaev, R.I.; Matushchenko, A.M.; Ryabev, L.D. ; Strukov, V.G. ; Chernyshev, A.K. ; Yudin, Yu.A. "Catalog of Worldwide Nuclear Testing". Archived from the original on 2013-12-19. Retrieved 2013-12-28. An equivalent list available on the internet. ↑ "UK/US Agreement". Archived from the original on 2007-06-07. Retrieved 2010-10-21. ↑ "N° 3571.- Rapport de MM. Christian Bataille et Henri Revol sur les incidences environnementales et sanitaires des essais nucléaires effectués par la France entre 1960 et 1996 (Office d'évaluation des choix scientifiques et technologiques)". Assemblee-nationale.fr. Retrieved 2010-10-21. ↑ "Nuclear Weapons Test List". Fas.org. Retrieved 22 September 2018. ↑ U.S. Department of State, Limited Test Ban Treaty. ↑ "CTBTO Factsheet: Ending Nuclear Explosions" (PDF). Ctbto.org. Retrieved 2012-05-23. ↑ "Status of signature and ratification". Ctbto.org. Retrieved 2012-05-23. ↑ "The Status of the Comprehensive Test Ban Treaty: Signatories and Ratifiers". Arms Control Association. March 2014. Retrieved June 29, 2014. ↑ Council, National Research (11 February 2003). 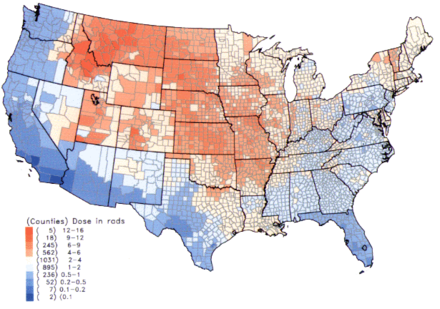 Exposure of the American Population to Radioactive Fallout from Nuclear Weapons Tests: A Review of the CDC-NCI Draft Report on a Feasibility Study of the Health Consequences to the American Population from Nuclear Weapons Tests Conducted by the United States and Other Nations. doi:10.17226/10621. ISBN 9780309087131. PMID 25057651. 1 2 3 4 5 News, A. B. C. "International News: Latest Headlines, Video and Photographs from Around the World -- People, Places, Crisis, Conflict, Culture, Change, Analysis and Trends". Abcnews.go.com. ↑ "Radiation Exposure Compensation System: Claims to Date Summary of Claims Received by 06/11/2009" (PDF). Usdoj.gov. The Partial Test Ban Treaty (PTBT) is the abbreviated name of the 1963 Treaty Banning Nuclear Weapon Tests in the Atmosphere, in Outer Space and Under Water, which prohibited all test detonations of nuclear weapons except for those conducted underground. It is also abbreviated as the Limited Test Ban Treaty (LTBT) and Nuclear Test Ban Treaty (NTBT), though the latter may also refer to the Comprehensive Nuclear-Test-Ban Treaty (CTBT), which succeeded the PTBT for ratifying parties. The Nevada National Security Site, previously the Nevada Test Site (NTS), is a United States Department of Energy reservation located in southeastern Nye County, Nevada, about 65 miles (105 km) northwest of the city of Las Vegas. Formerly known as the Nevada Proving Grounds, the site was established on January 11, 1951 for the testing of nuclear devices, covering approximately 1,360 square miles (3,500 km2) of desert and mountainous terrain. Nuclear weapons testing at the Nevada Test Site began with a 1-kiloton-of-TNT (4.2 TJ) bomb dropped on Frenchman Flat on January 27, 1951. Many of the iconic images of the nuclear era come from the NTS. NNSS is operated by Mission Support and Test Services, LLC. Project Plowshare was the overall United States program for the development of techniques to use nuclear explosives for peaceful construction purposes. As part of the program, 31 nuclear warheads were detonated in 27 separate tests. Plowshare was the US portion of what are called Peaceful Nuclear Explosions (PNE); a similar Soviet program was carried out under the name Nuclear Explosions for the National Economy. Operation Greenhouse was the fifth American nuclear test series, the second conducted in 1951 and the first to test principles that would lead to developing thermonuclear weapons. Conducted at the new Pacific Proving Ground, specifically on islands of the Enewetak Atoll, all of the devices were mounted in large steel towers, to simulate air bursts. This series of nuclear weapons tests was preceded by Operation Ranger and succeeded by Operation Buster-Jangle. Operation Teapot was a series of fourteen nuclear test explosions conducted at the Nevada Test Site in the first half of 1955. It was preceded by Operation Castle, and followed by Operation Wigwam. Wigwam was, administratively, a part of Teapot, but it is usually treated as a class of its own. The aims of the operation were to establish military tactics for ground forces on a nuclear battlefield and to improve the nuclear weapons used for strategic delivery. 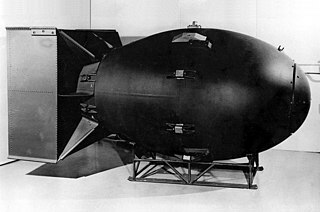 Operation Wigwam involved a single test of the Mark 90 Betty nuclear bomb. It was conducted between Operation Teapot and Project 56 on May 14, 1955, about 500 miles (800 km) southwest of San Diego, California. 6,800 personnel aboard 30 ships were involved in Wigwam. The purpose of Wigwam was to determine the vulnerability of submarines to deeply detonated nuclear weapons, and to evaluate the feasibility of using such weapons in a combat situation. The task force commander, Admiral John Sylvester, was embarked on the task force flagship USS Mount McKinley. WIGWAM was the first atomic test in the deep ocean, and it remains the only test that has been conducted in water deeper than 1000 ft.
Operation Hardtack I was a series of 35 nuclear tests conducted by the United States from April 28 to August 18 in 1958 at the Pacific Proving Grounds. At the time of testing, the Operation Hardtack I test series included more nuclear detonations than the total of all prior nuclear explosions in the Pacific Ocean. These tests followed the Project 58/58A series, which occurred from 1957 December 6 to 1958, March 14, and preceded the Operation Argus series, which took place in 1958 from August 27 to September 6. The Pacific Proving Grounds was the name given by the United States government to a number of sites in the Marshall Islands and a few other sites in the Pacific Ocean at which it conducted nuclear testing between 1946 and 1962. The U.S. tested a nuclear weapon on Bikini Atoll on June 30, 1946. This was followed by Baker on July 24, 1946. Underground nuclear testing is the test detonation of nuclear weapons that is performed underground. When the device being tested is buried at sufficient depth, the explosion may be contained, with no release of radioactive materials to the atmosphere. Operation Charioteer was a series of 16 nuclear tests conducted by the United States in 1985-1986 at the Nevada Test Site. These tests followed the Operation Grenadier series and preceded the Operation Musketeer series. The United States's Fulcrum nuclear test series was a group of 21 nuclear tests conducted in 1976-1977. These tests followed the Operation Anvil series and preceded the Operation Cresset series. 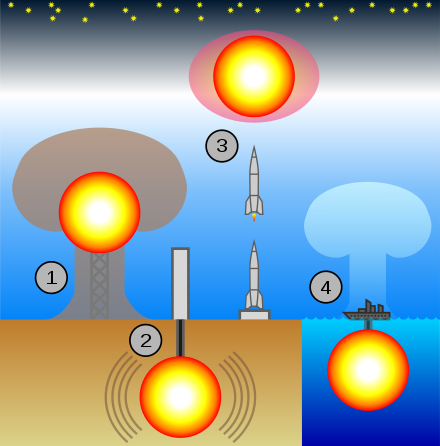 Wikimedia Commons has media related to Nuclear weapon tests .